JP's Music Blog: CD Review: Rockabilly Star Bill Kirchen Is Sewing New "Seeds And Stems"
CD Review: Rockabilly Star Bill Kirchen Is Sewing New "Seeds And Stems"
Rockabilly singer/songwriter/guitarist Bill Kirchen is preparing to release his brand-new studio album, "Seeds And Stems," on June 18. Bill Kirchen is one of the founding members of the late-sixties/early-seventies band Commander Cody and his Lost Planet Airmen who had a top ten hit in 1972 with "Hot Rod Lincoln." The new album mixes a couple classic Commander Cody songs along with a bunch of new original songs. Kirchen even tries his hand at the Bob Dylan classic, "It Takes A Lot To Laugh, It Takes A Train To Cry" with much success. Bill Kirchen was nicknamed "The Titan of the Telecaster" for his ability to control the instrument unlike anyone else at the time and the songs "Too Much Fun" and "Semi-Truck" can attest to that statement. Kirchen took the fast-paced rockabilly original "Womb To The Tomb" and reinvented it into a county-blues number, while "Swing Fever" sounds like something Brian Setzer and the Stray Cats would have recorded back in their heyday. Bill Kirchen revisits his past once again for the Commander Cody hit "Hot Rod Lincoln" as his band puts the tempo into overdrive and just jams to classic licks by Johnny Cash, Roy Orbison and others to extend the song to almost eight-minutes. The album closes with the guitar plucking story of "Talkin' About Chicken." Bill Kirchen and his band are currently on tour which stops at Bridge Street Live in Collinsville, CT on May 16 before continuing on until July 4th. 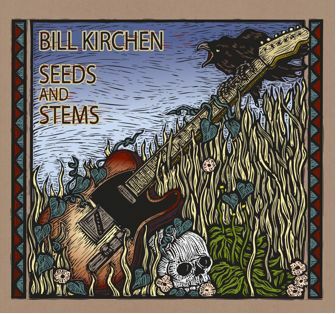 For a complete list of live dates and for more information on the new album, please visit billkirchen.com.